August really hasn't been a great month for me on Instagram. As I've said in previous posts I was growing reasonably well, gaining about 100 followers a month, but in August I hit a barrier and I have really struggled to get past it. I'm not sure what's happened but unfollows have probably been even higher than usual and I guess because I'm not gaining as many followers as before I haven't been growing. I'm pushing on though and enjoy creating pretty images for my account. T:L A post on this brush will be following in the near future so I won't say too much about it here but it's certainly a very Instagramable brush in all it's mermaid like beauty. T:M The last weekend in August I had a family wedding that me, my boyfriend and two friends attended. We had a great time messing around in the photo booth and eating all the candy from the candy cart and this was the beautiful wedding cake that I didn't have a piece of because I ate too much candy! T:R Playing Pokemon Go means I've been doing a lot of walking around Cheltenham hunting those Pokemon and when it's a gorgeous day I've been enjoying taking some photos at the same time. Pretty much anything looks pretty with a backdrop of a beautiful blue sky. This is the bandstand in the Montpelier gardens. M:L I knew there was a parcel waiting for me back at my parents but didn't know what it was because when I spoke to my mum she couldn't quite remember the name! When I returned home I was delighted to discover it was some Kiehl's products. I've only tried one Kiehl's product before and they're a brand I definitely want to try more from. M:M One of the last times I went to visit my in-laws I found this amazing plant in Sainsburys that I had to bring back with me. It's called a Celosia (or Cockscomb!) and it has beautiful and unusual purple flowers (that look pink in photos) and dark leaves. M:R I haven't actually tried these products from Mary Kay yet but the bronze, silver and gold shades were very appropriate at the time I took this picture because of the Olympics. I didn't manage to watch much of the Olympics this time but I did enjoy what I did watch. B:L We took the opportunity to have a wander around Bury St Edmunds to look for Pokemon when we headed back for the wedding and I was pretty impressed by the tower on the abbey. Again it looked amazing against a beautiful blue sky. B:M I'm not sure if you can still get them but if you popped your details into The Body Shop's Facebook page you could claim some free sachets of their new face masks. I've just tried both the rose and honey ones and I really liked them. B:R I nipped in a shop we have in Cheltenham called Vinegar Hill (I believe it is a chain) and I found a pretty cool vase that has a pearl effect to it that kind of makes it look like a bubble. I'm not sure if I should store some flowers in it or a few pretty make-up brushes. What do you think? 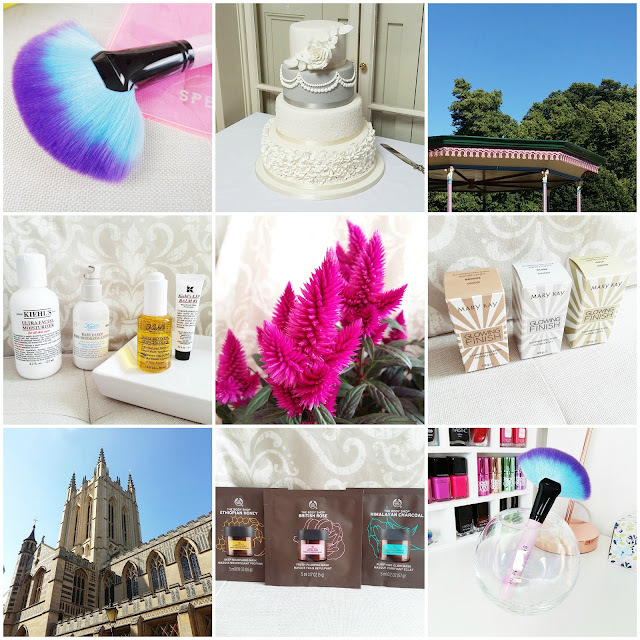 This month I'm recommending some bright and colourful Instagram accounts for you to follow. A fun, bright account really catches my eye and I'm likely to hit follow. My recommendations for bright accounts would be @aww.sam, @linesacross, @violettinder and @labelsforlunch. Is there any accounts you think I should be following?